With well over 6 million CCTV cameras in the UK, we Brits are accustomed to being watched. This is even more obvious when you’re a British driver, with recent news telling us authorities will use cameras to detect drivers using cycle lanes and mobile phones. Now, in-car technology is being developed that takes driver surveillance to a whole new level. With in-car cameras, lasers, and radar to detect who you are and what you and your passengers are doing, car manufacturers can soon track your habits and behaviours—but does this potential for safer driving mean a dangerous lack of privacy? Connected cars are nothing new. In 1996, General Motors launched the first connected car with ‘OnStar’ in some of their Cadillac models, designed to get emergency help to a car in an accident. The Cadillac CT6 already uses cameras to check the driver’s eyes for lack of attention and drowsiness and many other carmakers are following along with some of their models possessing similar functions. But what else can drivers expect to see soon? 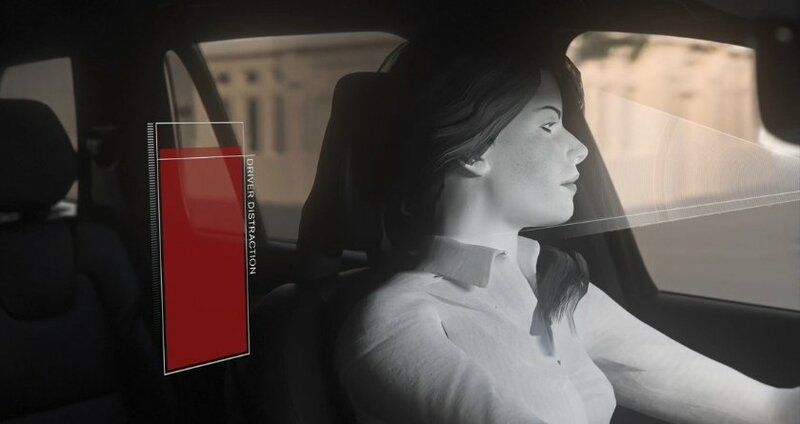 BMW has developed what they call ‘Natural interaction’—gaze recognition along with improved gesture and voice recognition—for their iNEXT model, available from 2021. BMW says the gaze recognition allows motorists not just to control the car interior with their eyes, but the high-definition camera in the dashboard can tell what the driver is looking at outside, too. The manufacturer says drivers can look at a restaurant as they drive past and find out the opening hours, what’s on the menu, and even book a table. And thanks to improvements in vertical-cavity-surface-emitting lasers (VCSEL), cameras might soon have the same technology as Apple’s FaceID software to display a variety of data of who is inside the car. Cameras don’t work at their best in cramped areas, such as cars, because of objects—like seats—blocking the camera’s view. This is where radar works better. Firms such as Texas Instruments are using millimetre-wave radar technology, which takes very detailed measurements because it uses such small wavelengths. Developers are working on various applications, including the ability to differentiate between males, females, and even dogs within a car. Radar technology could detect the direction passengers face in self-driving cars—where occupants may face in various directions—so airbags and other passive safety systems can configure themselves in a crash. Careys has built two radar systems; with one measuring biometrics and health—such as respiration and heart rate—and another that counts the number of passengers and their positioning. Vayyar and Brose are working together to get cars to detect obstructions outside the car by limiting how far the door can open. This will not only prevent drivers from having their cars dented by hitting walls, poles, etc. but will also protect cyclists from ‘dooring’. Earlier this year, Google got the approval of the Federal Communications Commission (FCC) to use millimetre-wave radar to work at higher power levels for their Project Soli. A microchip emits the radar and allows users to press a virtual button or turn a virtual dial by identifying fine finger gestures, which the chip then translates into commands resembling touches on a screen. The FCC said the decision to provide a waiver for the project “will serve the public interest by providing for innovative device control features using touchless hand gesture technology,”. B-Secur says everyone has a unique electrocardiograph (ECG) signature that technology can use to assess our condition while driving and even unlock our vehicles. The company is working on biometric technology that will place medical-grade ECG sensors inside car steering wheels to monitor the motorist’s health via their cardiac rhythm. No doubt these advances in automotive technology will provide many benefits to drivers and other road users, but they come with concerns; one of which is privacy. Consider the information your connected car will collect: It will have access to your personal information, location, calendar; shopping and driving habits; whether you speed, forget to use your seat belt, the state of your health, your email content—and much more. Sharing so many of your personal details has the potential of leaving you vulnerable to unwanted advertisers and hackers—or perhaps you might receive a fixed penalty notice or parking fine without a police officer or traffic warden in sight! Yet, most of us own a smartphone these days, which means giving up a measure of privacy (think of Google Maps needing to know our location to work at its best) and the same applies to connected cars. When we enable and use certain car functions, we decide that the value we derive from the car’s software outweighs our privacy concerns. But privacy is not the only concern; there could be fatal consequences if, for example, a hacker can download malicious software to the computer responsible for automatic braking. Only when these ‘cars of the future’ are part of day-to-day life will we understand the full repercussions of their use—both positive and negative. Even today, Volvo released a set of new features for all cars from 2021 to improve the safety of drivers. One of these is an in-car monitoring system, and we’ve attached the video below for you to watch. How do you feel about your car tracking and monitoring you? Do you already use any of the technology mentioned? Tell us your views in the comments. As you say nothing is 100% safe but, there are enough safety features that can save lives. I’m all for it, bring it on. Not sure whether I have read this right, maybe something wrong with my eyesight! “The manufacturer says drivers can look at a restaurant as they drive past and find out the opening hours, what’s on the menu, and even book a table”. I hate it! Big brother really will be watching you.Give me an old car with minimal, or better still no electronic controls any day. I want to be in control of the car, not have the car being in control of me! Anything that reduces the horrendous toll of deaths and serious injuries on our roads is to be welcomed. I’m sure that the aviation industry would very quickly sharpen up its act if there was the equivalent of an air crash killing a couple of hundred people every five weeks or so in the UK, so perhaps its long overdue that much stricter control of driving is introduced. my privacy is more important. especially when passing data to insurance MAFIA is mentioned! As for your last sentence – It’s coming soon. correction that tech is already here and has been since google and amazon put out their little watch dogs for our homes. [alexa google home] even your dam phones with siri for gods sake. Yes, and idiots in their masses are embracing it with open arms. That why they are taking it to the next level. Where are these kinds of comments on all the usual articles about self-driving cars? I usually feel like I’m the only one, amidst the idiotic predictable responses like “ooh, won’t it be convenient… we’ll all be much safer”. Well 1800 people killed on the roads of the UK last year – it has to be said that human drivers aren’t working out that well. 37.5M cars on the road. 1710 killed last year. From UK GOV source. All time high number of cars, all time low number of deaths. We also have amongst the lowest casualty road death rate in the world. So I have to disagree in the UK. Places like Russia though… just watch a dashcam clip show. Wear a crash helmet / face mask in the car…. I want to see the report that says the camera has detected Kermit the frog driving my car!!!! Not as daft as it sounds as the majority of deaths in road accidents is down to head injuries. As if “they” don’t have enough ways to spy on us already!? There will be a degree of financial coercion to this, because Insurers will charge impossibly high premiums to those who refuse to be tracked, & about a third as much for those who agree to be monitored, – i.e. most people. This then gives the insurers a huge amount of power, because they will then decide whether you’re driving is to their taste, or not, & they will retain the sanction of withdrawing your cover. So, it all depends on whether you think that unseen control is the way to go, not that you’ll actually have much choice. Just ‘hack’ the black box in the car so it only sends back information that they would want to see. Smear some oil on the camera or laser lens, just enough so it looks accidental and they can’t get any usable data on you. If enough of us sabotage these things, they’ll have to give up their attempts to spy on us. There would be people out there who’ll buy a cheap car for £200 & not bother to insure it. When police seize it, they won’t be worried, they’d just go out & buy another one. They already do what your saying Clive. They can do that now already and do, but that increased in popularity when they got rid of the tax disc. We a suppose to be living in a free and democratic country , I don t think the safety Nazis should be allowed to take our freedom , people died to save our freedom let’s not give it up. Which hospital is this scary ward in? I think most of us know Miss Mo meant world, not ward. Helpfulness is better than sarcasm Lecky. But will drivers be happy to give up their privacy for the benefits of this new technology? I certainly won’t. For every advantage of using new technology there are usually several drawbacks; and with this, apart from the problem of infiltration from hacking third parties, there is the dubious question of how what is recorded will be interpreted and by whom. I will be avoiding this like the plague. Good point. Pilots were trying to override the computer without success. Big Brother will watching you no more stopping in layby’s etc. My dogging days will be over. Nah, you’ll just have a larger audience. I don’t know if my car tracks me but it shows if i’m in or out of lane if it tracks me all the better. Time learn how to hack and reprogram all these so called improvements to stop the ongoing privacy invasion, in the mean time buy an and old polluting car. The idea is terrible & certainly invasive. This is of course a step towards the driverless car but I wouldn’t trust ever more complicated technology to work properly in every situation; however it seems they would trust their technology more than us to drive safely. It is yet another example of adults being treated like children, instead of trusted. Display to a driver all the details, including menu and opening hours, of a restaurant?? Any manufacturer producing such a device should be banned from marketing it!!!! Don’t buy one of these cars. Just wait until the electronics fail and the incompetent driver breaks a mirror. Once it’s written off and in the salvage yard, grab the engine and running gear, stick it in a custom frame with a Q plate, grind off the engine number (don’t know why it’s not there officer), junk the dpf or catalyst, remap the ECU and drive. Alternatively, just buy a pre 2009 car. I’m happy with the safety aspects but wonder how easy it would be for a burglar the get access and identify when you are far away from home. In the extreme unlikeliness that I would want to buy any vehicle with this sort of equipment in it as standard it would be torn out/bypassed immediately. The more technology I see going into new cars the less I want to own one! This quite frankly is very disturbing. No way do I wish other people to know what I’m doing, never mind unknown people. Also the potential for misuse is terrifying . Big brother really is here now, and I fear we face the end of freedom as we know it. We won’t be able to do anything without somebody else knowing. Pointless lies saying it’s for people’s benefit, I can only see control eventually becoming the norm by those who definitely should NOT be in control God help us.. I think motor manufacturers have lost the plot as far as what the public want. Affordability reliability come before keyless entry and automatic braking every time. MORRIS 1000 anyone. Christ – and if you were in a Morris 1000 on the roads these days and got into a crash ? Dead. Automatic braking is a fantastic safety feature. Keyless entry is not. I shall be sticking with my 2005 Honda Civic for the rest of my life thanks! They will have to kill me to take it off me. I’ll just stick to driving my 45 year old Ford thanks. No electrical stuff to go wrong and I even got an advisory when it had an MOT last year (before the 40 year exemption came in) for having emissions “too clean to test” so therefore I’m doing my bit for the environment! I’m glad I’m 71 and not 21. What a crock of poo life is becoming! I haven’t even got a satnav and never want one. I drive my car, not some computerised “thing”! With you all the way on this one Stan, i have never had a mobile phone or indeed do i have sat nav in my car. However in the fullness of time future generations will be drawn into this way of life it is inevitable, its called progress. Not if you drive classics like I do. Just get a friend to unsolder one of the wires until you get a loose wire connection to the spy module. Job sorted 😉. Actually. Thinking about it. I’ve had my every driving move watched for years with a built in recorder and detector. It’s called a Mother-in-law. The only electronics in my lovely Land Rover DEFENDER are for starting the 2.5 litre Diesel and the various lights. Cars can already be hacked by the cyber terrorists so how long before they can select individual cars to have an ‘accident’? or how long before they decide to stop all traffic in motorways? So that Volvo will pull over and park if the driver isn’t behaving? F*ck all that quite frankly! With decades of experience, in my old age, I can see this being extremely unpopular with a certain section of our community. Not for criminal reasons, but for the age old reason of infidelity. This new device will be a major boon to divorce lawyers, who will be able to track their clients partners activities. I can see that going down well?